Have you ever driven or walked by something that caught your eye and thought: "I'd love to get a photo of that, it's so unusual..."? 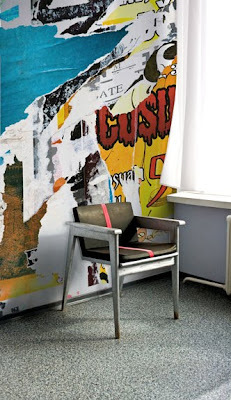 Be it a building or an architectural element, a piece of graffiti, or an interesting perspective on an everyday object, these are the types of random images that we love to be seen used as custom wallpaper installations. The custom wall mural in the inspiration room is based on an unintentional collage of posters and handbills I've seen over and over again that I've intended to photograph. Located on (in)famous 8 mile, all of these posters that have been pasted up are slowly peeling away, revealing previously posted announcements. Ripped and jagged, colorful with haphazard streaks of torn white paper highlights, the potential eyesore has always had a striking effect on me. The wall mural shown is thus an approximation of this accidental work of art on 8 mile. Again, exactly the type of random image that we encourage you to look at with a more discerning eye. Though these images create unexpected and non-traditional murals and giclee, the overall effect they can have on your home is immense.